The Q-Tips Swabstick 6 Inch Wood Shaft 2/Pack - Sterile are used to swab for a specimen from a patients mouth for the use of testing or other lab work. The swabsticks are made of a 6-inch wood shaft that offers a safe distance from the nurse and the patient and is able to be used to swab areas deep in the back of the mouth. The mckesson 24-106-2S 6 inch wooden q-tip swabsticks are packaged in sets of 2 so you can offer these either alone or use them to make a pre-packaged kit for quicker use for staff which in turn helps save time by not individually obtaining the tools that you may run out of and have to reorder more as soon as possible, wasting time and money. 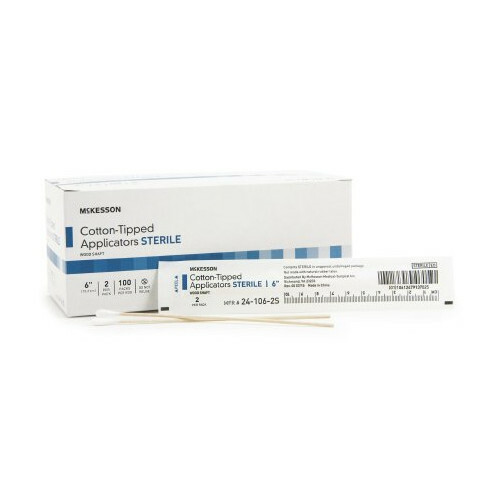 The Mckesson cotton tipped applicators are provided sterile for an antibacterial experience; by providing a clean swabstick you help eliminate giving the patient any harmful bacteria and help reduce such bacteria from growing on the swabstick which can be a problem by altering the specimen - ultimately leaving your specimen useless and the need to re-swab. While swabbing, you may come in contact with unwanted specimen, you can use the Guardall Full Face Shield . The Mckesson sterile cotton tipped applicators are made of a high absorbency cotton, making them quickly absorbent and able to retain specimen such as saliva. The entire equipment is free of any latex material, this is a huge plus for using the swabsticks on people who may have such allergies. Keep clean and free from bacteria with a antibacterial soap such as the Antimicrobial Gel Soap by McKesson. Needed more of these, found them here at a reasonable price. In stock and shipped within a reasonable amount of time. Thank you for having these sterile swabsticks! Needed to buy these in an emergency, thankfully Vitality Medical carries these products, and they arrived much sooner than the estimated delivery date, which was a bonus. Package arrived intact too. Thank you! Although they are "Just q-tips" the price is reasonable and quality too. Vitality Med. is on the mark again.